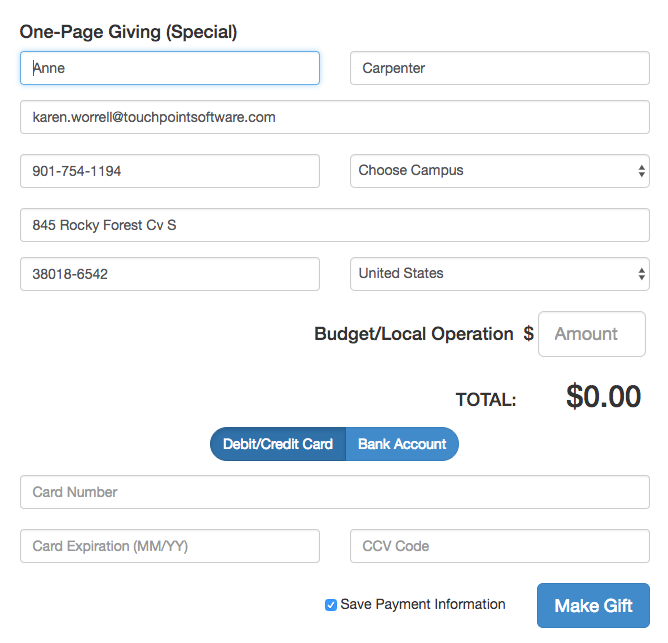 This Ad Hoc Extra Value can be added to an Online Giving organization if you are using the One-Page Giving option and you do not want the list of other Funds to display below your default fund. This is how the one-page form looks when you specify a Fund on the Fee tab and you have added the Extra Value to disable the drop-down list of funds. Go to the Organization that has Online Giving selected as the Online Registration Type and select the Settings > Extra Values tab. Click Show Ad Hoc Extra Values and then click the green Create New Ad Hoc Extra Value. Select Code as the Type. Enter DisableFundsDropDown as the name. Enter true as the text value. Now, just test your registration and you will see the option to give to only one fund.